The wrist is a complex joint that connects the radius and ulna (the 2 bones in the forearm) to the carpals in the hand. 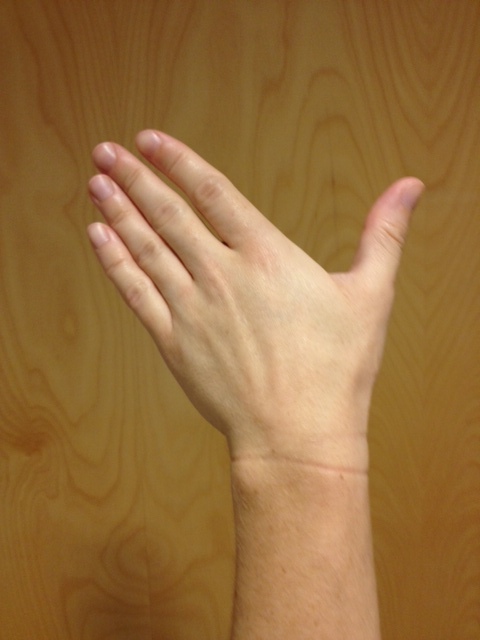 In most textbooks you’ll find that wrist’s purpose is stated as follows: “The wrist (and hand) allow for the manipulation of objects in space and provide us with the dexterity required for fine motor skills.” While that is the case for most people’s requirements of their wrists, gymnasts often use this joint as a weight bearing structure, and as such, injury is common. The wrist is the junction of the distal end of the radius and the carpal bones. It is often compared to the ankle joint(s) in structure, however through evolution, the wrist has become more delicate and lost many of the characteristics that would allow it to be a truly effective “weight-bearing’ joint. The bones are smaller, there is less cartilage, and the ligaments are thinner – a trifecta of risk for injury and instability. The eight carpal bones can be divided into two rows of four bones. The proximal (or closer) row is composed of: (running from thumb to pinky) the scaphoid bone, the lunate bone, the triquetrial bone, and the pisiform bone. The distal (or farther) row is composed of: the trapezium bone, the trapezoid bone, the capitate bone, and the hamate bone. Why are the names important? They’re not (unless you’re heading into the medical field) – but it helps to know so that I can tell you that the scaphoid is the most commonly fractured as its location makes it more susceptible to weight and force. 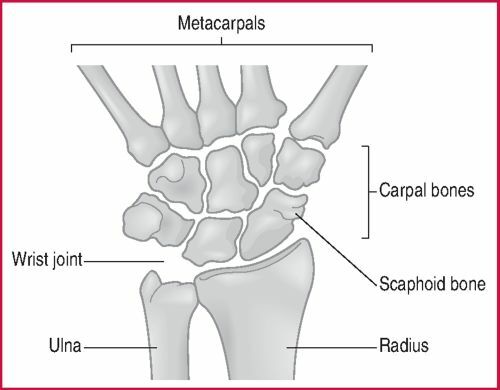 Though there is no direct connection between the carpals and the ulna, there is a cartilaginous disc (shown in the picture below) that acts to allow increased congruence between the ulna and the carpal, as well as maintain the space on the ulnar side of the joint. This disc is known as the Triangular Fibrocartilage Complex (or TFCC) and is commonly injured in weight bearing activities. The distal radioulnar joint: This is the point just prior to the wrist where the radius and ulna connect. This is not a synovial joint, but rather exists because of the interosseus membrane (a thick ligamentous structure that connects them). This is best described as a “pivot” joint and allows (in conjunction with the proximal radioulnar joint at the elbow) the forearm to pronate (turn down) and supinate (turn up). The stability of this joint is essential for any weight bearing on the hand and wrist as it creates the “mortice” for the proximal carpals. 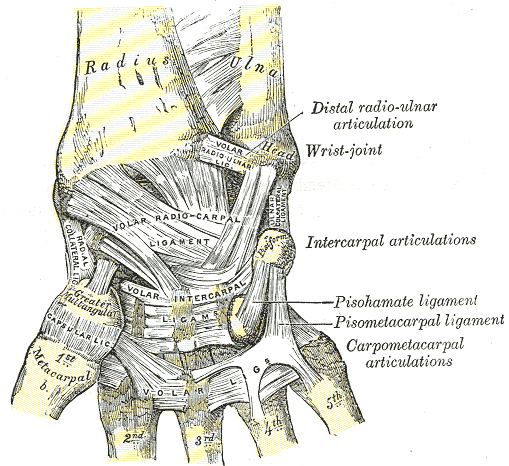 The radiocarpal joint: This is the intersection of the distal end of the radius and the proximal row of carpals (as described above). It is a true synovial joint, meaning that there is a joint capsule containing lubricating fluid within. The proximal row of carpals is convex on the concave radius. 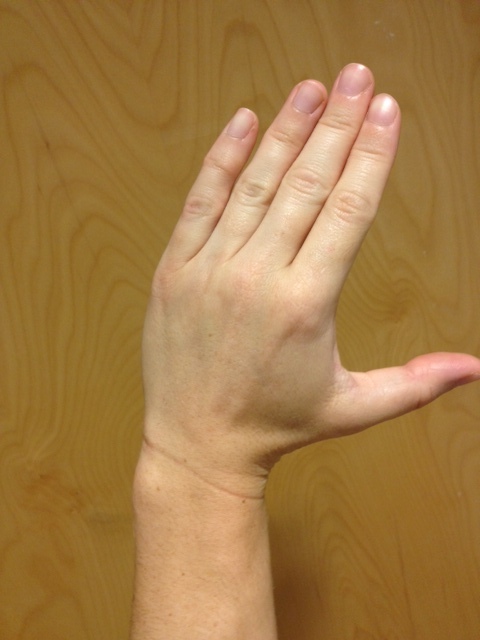 This joint allows the hand and wrist to move down (palmar flexion) and up (extension or dorsiflexion). In gymnastics, more extension is required than most other sports as weight bearing forces the wrist into that position. For this reason, often the radiocarpal joint is hypermobile (extra flexible), bordering on unstable, and is very susceptible to injury. This joint also allows a side to side glide which causes the hand and wrist to “tilt” left and right into radial deviation and ulnar deviation. The midcarpal joint: This is the intersection of the proximal row and the distal row of carpals. Though it is not a “true” joint and it is often overlooked in many introductory anatomy texts, it is essential for achieving end-range motion (something gymnasts require). There is not as much motion available in this “joint” as the radiocarpal, but these bones glide to allow to the same motions as the radiocarpal joint. Think of the joint as a “helper joint” in that alone it cannot perform the motions, but rather boosts the radiocarpal joint’s range. 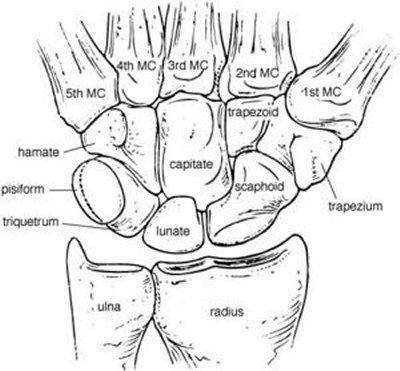 Palmar Intercarpal Ligaments: A series of ligaments that extend transversely across the palmar (front or volar) surface of the wrist connecting the carpals to one another and the carpals to the radius/ulna. These ligaments are thicker than the dorsal ligaments (which works our well for gymnasts as these ligaments support the front of the wrist and palm in weight bearing). Two named ligaments exist: the palmar (volar) radiocarpal ligament and the palmar (volar) intercarpal ligament. 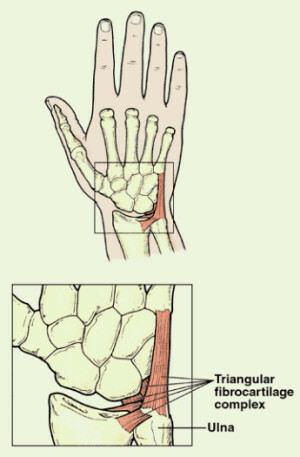 The anterior band, known as the Flexor Retinaculum (aka transverse carpal ligament), travels across the palmar side of the wrist and forms the “Carpal Tunnel.” This tunnel is supported on the sides and back by the carpal bones, and has all of the flexor tendons (in synovial sheaths), the median nerve, and several arteries and veins traveling through it. Alright, on to the muscles…In order to simplify a rather massive amount of information, I’ve divided these muscles into the action they perform. 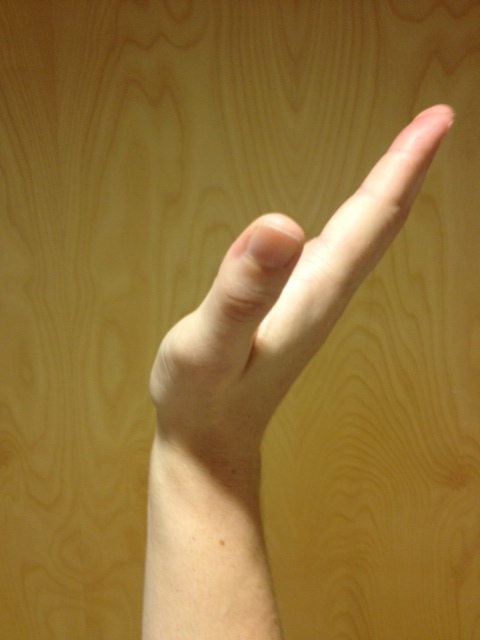 Radial Deviation: tilting the hand and wrist toward the thumb and radius. Muscles include: Flexor Carpi Radialis & Extensor Carpi Radialis (they work together to cancel the flexion and extension and instead just pull toward the radius). This motion is more important in weight bearing activities on the balance beam, rings, pommels, and p-bars when using the wrists to maintain an inverted position. 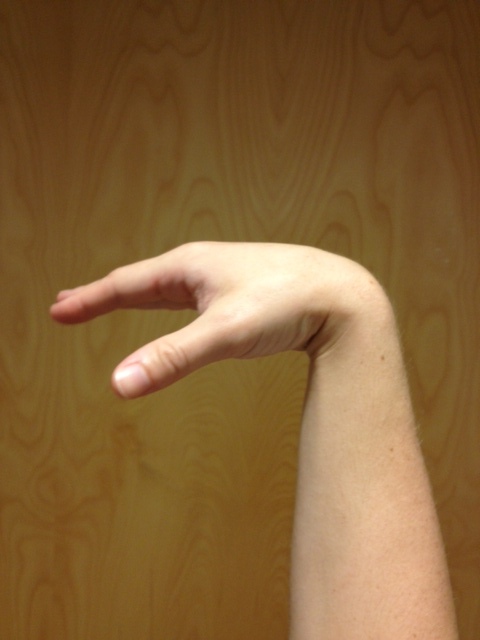 Ulnar Deviation: tilting the hand and wrist toward the pinky and ulna. 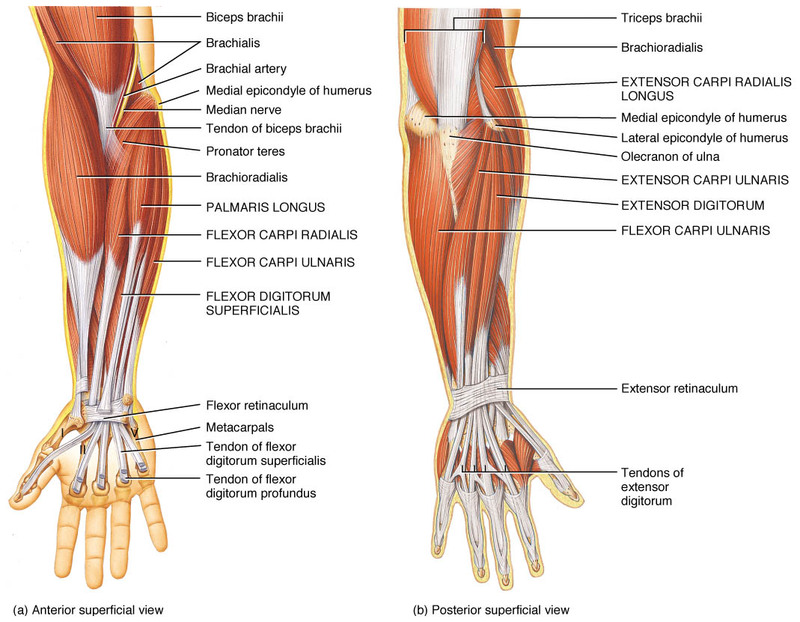 Muscles include: Flexor Carpi Ulnaris & Extensor Carpi Ulnaris (they work together to cancel the flexion and extension and instead just pull toward the ulna). This motion is more important in weight bearing activities on the balance beam, rings, pommels, and p-bars when using the wrists to maintain an inverted position. The anatomical complexity and versatility of the wrist is what allows gymnasts many of the abilities required for skill acquisition. However, these same traits also lend the wrist to injury and overuse – but I’ll save that discussion for a later date. This entry was posted in Wrist/Hand and tagged gymnastics, wrist, wrist pain, wrist sprain on September 14, 2013 by Angie.